Don Emry: Purdue University, Industrial management. DP: Q: What inspired you to go into hardware/game design? Don Emry: It looked like a more entertaining job than writing service manuals and it paid better. DP: When did you start working at Magnavox? What were your job responsibilities? Don Emry: I joined the Odyssey team in Jan 73 as the Assistant Product Planner, moving over from the Technical Support group where I had worked on the documentation for the original Odyssey. It was one of my better sales jobs talking my way into the marketing department to work on the project with Bob Fritsche, who was the Product Planner. I worked directly on the Odyssey project for the first 8 months of 1973. I did most of the user manual for the first release and then was responsible for developing new games and updating some of the old games for the second release. The production was in Knoxville, TN. I worked at the headquarters in Fort Wayne, IN. Don Emry: During the time I was developing the new games, I spent almost all of my time playing games of various types to see if they would work on the Odyssey and then perfecting the graphics of the overlays and the game rules and actions. Thus, I claim to be the world’s first professional electronic game player. Back in those days, the overlays were a relatively unique concept and there was no other standard for how a TV game should look or work. Actually, there was a children’s TV show in the early 50’s that required the kids to use a clear overlay as a drawing board. The kids would use a grease pencil to follow the movements of the TV host and thus draw a cartoon style picture. DP: Do you recall which games you worked on? Were games assigned or chosen? Don Emry:I did all of the second release games for 1973. Interplanetary Voyage and Basketball were totally my own. WIN and Brainwave were concepts that came from a game consultant that I expanded and completed. As I recall, the original games for 1972 were mostly created by an outside consultant, with some input from Bob Fritsche. All of the game work that I did was bounded by the electronics capabilities of the circuitry and game cards. At that time, early 73, there was no budget money to work on the electronics. It would seem that no new games or system variations were produced after I left, which would make sense since there was no warm body there to do the work and very little support from management. DP: So there were really only 12 different cards/games that could be done on the Odyssey, and whatever or however many games were made were defined by what card was used, and what rules were defined? Don Emry: That is correct. DP: How hard was it to keep coming up with something new for this machine? Was it down to the extra trappings (overlays, game pieces, cards, etc. ), or was it really possible to create something new that wasn't a variation on one of those dozen games? 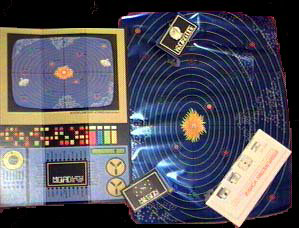 Don Emry: The game box electronics was designed to have certain screen attributes and reactions to the control movements. Each of the 12 cards selected a set of these attributes. Now the real esoteric concept is that no game existed until a human defined the manipulations according to set of rules. Therefore, you can take the same set of attributes and define different games. The game rules were enhanced (or l imited) by the overlays. Then you add the extra bits and pieces, primarily as scoring devices or used the game attributes as "pseudo set of dice" to manipulate the external bits and pieces. For example, I created Basketball and Interplanetary Voyage by redefining to the players what the controllable screen attributes represented, and then reinforced that definition with the overlays. Brainwave used the "pseudo dice" concept, a battle session that was another game when played with another overlay, to determine the movement/placement of pieces on an external game board. If you carefully examine any video game, you will see the same phenomenon - a set of controllable attributes defined by context to create the "game". You can really extend this insight to almost any board game. Look at the motion/attributes that determine the flow of play. Now, the really good question is what makes a particular set of attributes and visual support into a poor, good, great or superb game? DP: Do you know of the existence of card number 11, which is mentioned in the Service manual, but not supplied with any game? Do you think there was a prototype card of it? This is a card every Odyssey collector considers their “holy grail”. Don Emry: I am vague on card 11, but I think it was similar to one of the other cards, but had vertical line(s). I don’t think we ever had a game specifically for it. Engineering would have used something similar to what you call a "proto" card in the early stages of development to finalize the traces on the production cards. The 12 cards would have exercised all of the logical capabilities of the system. DP: According to some original Magnavox document, #11 was initially designed for the Basketball game. Why did Basketball use #8 instead? 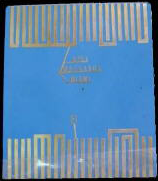 If you compare the pinouts, you'll see that the cartridges are almost same, so only a minor change in the game play would have allowed using cartridge #8, and so reducing the production cost. Don Emry: When I designed the Basketball game, I made the decision to use the #8 card. I don't recall the exact difference in the attributes of the #11 card. I see from the pin-out charts on David's site that there is only one small difference. I suspect that the #11 card had an additional vertical line, but one could easily modify a #8 to simulate the #11 and see what happens. There was no basketball game in the original game set or proposed games that used the #11 card when I took over the game development in 73. DP: What was the purpose of the blue double card (games #7 & #8 together on one card with opposite connecting ends)? When was it released and how (with games, on its own, or was it a testing card?). Don Emry: The double-A4 manual says that it might not have overlays (a gentle manner to say that they were not supplied as planned). This card just plays the same games as Magnavox cartridges #7 and #8, and since those games only had overlays in addition to the cartridges, the Apex card is only a rarer version (only two ones seen so far). I don’t recall the blue, double card at all, but I can see how it would have made sense. The cards were an “expensive” production item. DP: Were there any games that you started work on but never finished? Don Emry: I was working on some others that apparently did not go into production. One of them was a very nice upgrade to the Ski game that had a ski jump and a slalom course. I am drawing a blank on the others, but I think I had 8 games planned. DP: Do you know how many of the 1973 run of games were produced and sold? Don Emry: As best as I can recall, the planned production run was 11,000 sets, but I don’t know how many were actually produced. Ralph Baer recently told me that 350,000 units were actually built in all of the variations, which is a much higher number than what is reported on any web site, or what I recalled (I thought there were about 180,000 sets). In early 73, the warehouse was still full of them. I recall that the production people had to open all of them a replace the batteries. That would explain the "Run 2" versions. The "Run 1" was the original production that occurred while I was there, about 120,000 units as I recall, with another 60,000 parts sets left to assemble. It would seem likely that a large quantity of units would have carried a "renewal" designation to either replace the batteries or to update the production date for warranty purposes. All of the export versions occurred after I left, so I have no knowledge of them. The person who would really have all the answers would be Bob Fritsche, who was the product manger from inception until 1975. DP: Do you know Ron Bradford (of Bradford/Cout Design - lead designer for Odyssey promotional materials), or did the two of you ever worked together on the design of the Odyssey user manual or other materials. If so, do you have any comments about Ron or the design process? Don Emry: All of the graphic design for the first release was done outside of Magnavox. I don’t remember the company’s name as I was not involved at that time. I do recall that the advertising agency was Grey Advertising out of Chicago and that the game consultants were also out of Chicago. I did most of the original copy for the user manual, but someone else did the final draft and layout. My copy was “too technical”. I know I met some of those people, but I don’t remember the names. The brochure shown with the Bradford interview is the 1973 brochure as it lists the 1973 games that I worked on. DP: Do you recall if you had any serious problems, issues, or difficulties with designing the manual and the games? Don Emry: The only big issue with designing the games was cost. All of the bits and pieces and packaging had to be produced and we had a target figure of about $3 for a game. I learned a lot about purchasing and production costs. The whole project had a budget which was strictly enforced. DP: It's been suggested by several people that one of the main reasons the Odyssey sales suffered was because Magnavox implied strongly you needed one of their TV's for the system to work. I know that wasn’t the department you worked in, but do you recall hearing about that at the time and/or does it make any sense to you now, in hindsight? Don Emry: I don't buy the Magnavox-only theory. There is nothing that I can recall from any meetings or discussions or advertising or marketing plans at headquarters that would support that contention as Magnavox policy. It’s possible that some of dealers may have promoted that concept. As an opinion, I think the early bad decisions on the build quantities stifled our ability to make changes that would have improved the system. At that time, Magnavox was a premium brand and was only sold through carefully selected and monitored franchised dealers. Retail pricing was never broken except for authorized sales. It is possible that some or even many of those dealers may have made the suggestion, I just don't know. DP: As early as 1973, was there any talk of reformatting the Odyssey into the dedicated consoles (i.e. the Odyssey 100, 200, 2000 consoles that came later)? I'm just wondering if that repackaging was a product of competition from Atari's home Pong system, or if it actually predated Pong. Don Emry: In 1973, a “lite” or “junior” version was planned. 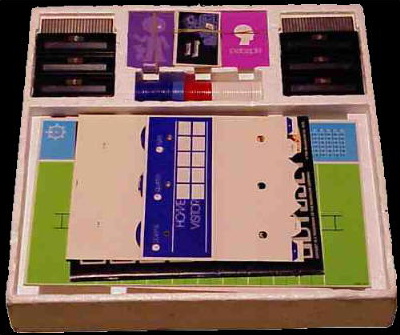 It would have only 5 games and the console and controllers were to be tan and brown to differentiate it from the regular game set, they were going to paint the white plastic case parts. I do not know if that model actually went into production as I was history in August of 73. Ralph Bear was not involved with the add-on games in 1973. I actually left Magnavox just as the add-on games went into production. 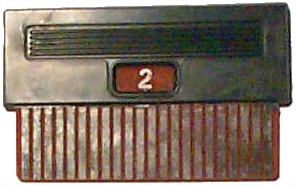 Speaking of history, Magnavox was bought out by Phillips in 1974 or 75, so the Odyssey2 was developed by that group and as far as I know, there was no carry over from the original group except for Bradford/Cout. Also keep in mind that in the late 60’s and early seventies, Integrated circuits were just appearing in consumer electronics and the concept of Moore’s Law was not yet formulated, so there was no way to predict the games of the 80’s, let alone what has happened since. I remember working with IC’s that had dual JK flip flops in 72 and thinking that was really good technology. Actually the electronics in the original Odyssey is quite simple, though exceedingly clever, compared to some of the other Magnavox products of that time. DP: What was the general attitude about this product at that time, when there was simply nothing to compare it to - did it come across to most as an expensive toy (at its initial price of $100) or as the forerunner to a new breed of gaming? Don Emry: The product was well received at the time. The sales for the initial selling season were right on projections. Unfortunately, the marketing VP's got so caught up in the excitement that they built about 3 times the projection which interfered with development in the second year when I came aboard the team. Another point to consider in the context of that time is that youth was not a virtue in the industry, unlike today. Experience was absolutely a requirement. I was 30 at the time and would have been the youngest person on the project. There were only two other guys in the marketing department younger than I, and they were treated like interns. As to the perception of the future of electronic games, yes it was apparent to me that it would be big. I remember some conversations we had with the guys from Chicago Coin. They had contacted Magnavox about building a coin game to compete with Pong. They told me how strong the customer reactions to Pong were as compared to the traditional electro-mechanical games. I learned a lot about "games" theory from them. Magnavox passed on the deal, not wanting to be associated with "that type of people". Yet another nail in the coffin! The VP's thought they were "Mafioso". DP: It’s not possible for the Odyssey to draw 2 vertical lines; however an Odyssey clone exists which has been slightly upgraded show goals for playing Football games. This particular system had additional line generators, as well as an additional gate matrix board to manage additional collisions on those "goal" lines. Do you recall if any upgrades were planned for the system? 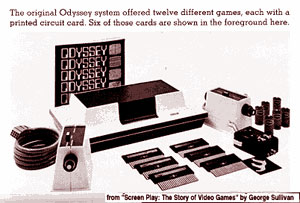 How long did Magnavox envision the Odyssey being a viable product? Were they hoping to keep turning out different games for the system past the 18-24 month life span that it eventually had? Don Emry: Magnavox would not have actually launched the product if the expected lifespan was only to be 2 years. The upfront costs were pretty high and there had to be some expectation of recovery. Once a product type is established, ongoing upgrades are a lot cheaper and expected. The drag on additional development of the product caused by the over-buy of parts and over-build of product in 72 limited everything we proposed or considered. Keep in mind that every product manger was competing for budget with the claim that their products were going to the most profitable and that TV's, Radios, Stereos and Tape recorders/players were proven products. Overlaying all of this was some incredibly poor management at the top levels of the company. In 1968, Magnavox stock was part of the Dow and priced around $60. In late 1974 the stock was down to $4 and NAP bought the company at $8. In my opinion, that in spite of very good engineering and production, the infighting, indecisiveness, and impulsive decisions of top management were to blame for the downfall. Odyssey was a minor casualty in this process. DP: Were you upset that the Odyssey pretty much died out within three years? Don Emry: I was long gone from Magnavox when they were bought out and did not give Odyssey much thought after leaving. I was too busy raising a family. I involuntarily left Magnavox in Aug. 73 in a downsizing - a futile attempt to save the company from a long series of bad marketing decisions. DP: Did you design/develop products after the Odyssey? Don Emry: I played around with computers in 76, a Sol III, and in 82 went into the computer business full time, mostly in software development. I never did do any further work on games. DP: Are there any stories, funny incidents, etc that you can recall from your days from working on the Odyssey? Don Emry: When I joined the marketing department I also became a member of the Magnavox Management Club, which was open to anyone above line supervisor, which turned out to be a good excuse for a monthly night out. Anyway, I got tagged with entertainment chairman due to my involvement with Odyssey. One event that I did was a Las Vegas night. I ordered several crates of the Odyssey money and poker chips from the warehouse and rented the gaming tables. It turned out pretty well except for the big winner finally admitted that he was walking around stealing all the loose Odyssey money to run up his score! DP: Were you (or Magnavox) aware of Space War? Don Emry: No I was not aware of Space War. In context, in the early 70's computers were the domain of really big business and university engineering departments. Ordinary people never got close to them. Actually Magnavox had a pretty good size computer system, they were even doing circuit designs with them, but I never got closer than peeking through the window. I did get to handle a lot of "green bar" printouts. Then I had to distill the info by hand to something that we could use. Computer time was horribly expensive as a departmental charge. DP: Did you ever meet Nolan Bushnell? Did you know about the Magnavox/Atari lawsuit? Don Emry: No, I never met Nolan Bushnell, but I was aware of the litigation. The courts agreed that Magnavox had the legal rights to the concept. My understanding is that Bushnell became a licensee of Magnavox. I think that occurred after I left. I did get to see the workings of the arcade Pong game. The electronics were far more sophisticated than Odyssey, but then the thing sold for about $850 compared to the $100 for Odyssey. DP: What was the “cellotape” primarily designed for? Some say it's for holding the TV overlays on the screen. Others said it’s for sticking onto the scoreboard to use (with felt-tip or whatever) for writing the score onto it, and later you can just remove the tape to keep the scoreboard clean. Don Emry: The tape was for holding the overlays. Usually the static electricity was sufficient. I never used the tape. DP: Were there any other "specialty" controllers on the drawing boards other than the Shooting Gallery rifle? Anything even remotely along those lines? Don Emry: There was discussion of using a joystick, but that was considered to be too expensive. You may be aware that there was a 4 player engineering prototype, but I never got to use it. I think that would have been interesting. DP: You say you were the first professional game tester - what kind of 'testing' and play control went into these games? Don Emry: The short answer to the testing question is "not much", and essentially none by today’s standards. From the standpoint of the electronics, they were so simple that it was pretty much when engineering said the circuits were stable and all of the attributes worked, the testing was done and engineering did that testing. I was not directly involved at that time and this was a "secret" project so I have to do some inference based on what I later learned. DP: What was the process between when a game idea was born and the game was released? Don Emry: The original overlay games with all the bits and pieces were essentially developed by an outside game consultant. Bob Fritsche told me that he and his family did most of the testing on those games. I did some of the user instructions on the original games and those instructions were written after the complete game designs were completed. I recall going over to a tennis center to find out how a game of tennis was scored. I don't think there was a great deal of play testing on the low action games like roulette. It was always my impression that "filling up the box" was more important to the marketing guys than the playability of the games. In context of the times, consider that the simple fact that you could do anything on a TV, besides watching, it was an amazement for most everyone. The initial "wow" factor carried the project. One of the specific reasons that I was transferred to the project was to improve the games and do more testing. I also had to respond to all of the user letters (people really wrote letters on paper then), so I got a lot of feedback from the customers. Bob Fritsche was so overwhelmed by the marketing issues, he no longer had time to play the games, let alone develop them. So I sat in my office and played with the bare game to understand how the screen actions worked and then drew up simple overlays to try various concepts. I would then grab anyone who could spare a few minutes to play the concept with me on the two player games. However, I could seldom get anyone to play with very long because by that time I was really proficient in using the controls. Basketball was an exception. I had a friend that was really excited about Odyssey and he and I spent a lot of time on that game, hours (not days and not certainly not weeks). So ultimately, I really created, designed (or finalized WIN) and tested the 1973 games by myself. I just had to show the marketing people what I had done. As I had previously mentioned, I also proposed some changes to the 1972 games, but none of the changes were ever implemented due to the large inventory on the shelf. By the way, I did most of Interplanetary Voyage before I joined the project. That game was my ticket to ride. So, when you consider the context of the time, no one really thought about play testing the games, no one had any experience, this was the first time for everyone. DP: Do you still have an Odyssey? Don Emry: Yes. It is unique in that I still have the original white over carton and the original Magnavox batteries. However, I don't seem to have the RF cable. This particular Odyssey was given to me when I left the company, along with the rifle. All of the extra paper and plastic games pieces are in their original packing. The rifle also is still in the original shipping carton. The Shooting Gallery was taken home before I left and just never got returned. DP: What was your favorite Odyssey game? Do you still play games today? Don Emry: I never really became much of a player, although I did become pretty proficient with Atari’s Star Wars coin-op, but that was a father/son thing. I probably liked the Basketball game the best. I doubt that I have played any of them since 73 or 74. I don’t play any video games, but I am/was pretty proficient with chess and Scrabble. DP: What are your thoughts on how the video game industry has evolved? Don Emry: I am not a "gamer" myself, but it’s clearly big business now. DP: What are you currently involved with? Don Emry: I am the owner of Emrico Data Systems, Inc. (www.watsoncard.com) Emrico is a world-wide, secondary market reseller of Computer Telephony Equipment.